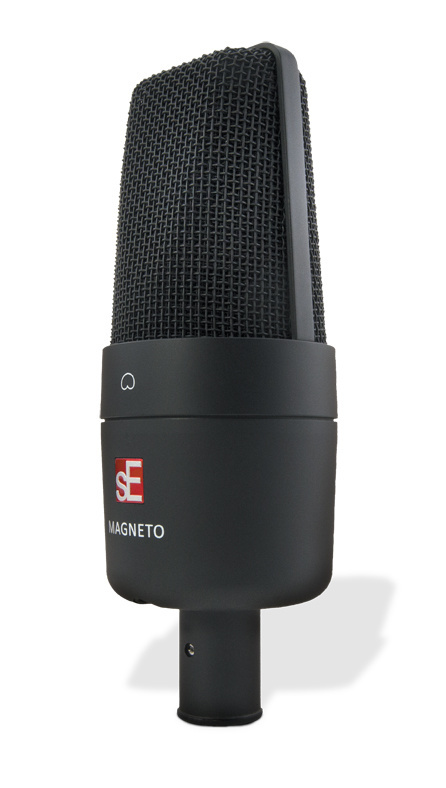 When I first heard of SE's new Magneto mic, my first thought was that it must be a dynamic model because, after all, dynamic mics are powered by magnets. However, the Magneto turns out to be a capacitor mic based on established back-electret technology, so its name probably has more of a Marvel Comics connotation — something that seems to be confirmed by stories of an initial limited-edition run in superhero purple! There are few companies geared up to build high-quality back-electret capsules, so the majority of companies offering mics based on them buy in the capsules and then design their own electronics to go with them. SE are no exception, though they also tune the capsules in-house prior to assembly. Rather than being based on a stripped-down version of an existing product, Magneto is a completely new design, and despite its entry-level pricing, it boasts a very respectable specification as well as the ability to run on any phantom power supply between 12 and 48 Volts. It comes complete with a swivel mic clip and thread adaptor as standard, with the SE Isolation Pack universal shockmount and pop shield kit (which I'd recommend) being available as an optional extra. As mics go, it is a no-frills affair, with a fixed cardioid polar pattern and no pad or roll-off switches, and it comes in a foam-lined cardboard box rather than a camera case, again to maintain a low selling price. By registering the mic with SE, you'll extend the warranty to three years, with a new-for-old replacement policy in the event that you experience failure. So, what do you really need from a side-address, cardioid-pattern capacitor microphone? Certainly low noise and a full audio bandwidth are good places to start, along with the ability to handle high SPLs when necessary. You also need solid engineering to ensure reliability and adequate protection for the capsule, but after that it gets more subjective as different mics suit different voices. Then there's the performance of the mic in its secondary role as a general purpose instrument mic. You'd be amazed at how many mics I've tested that had very similar paper specifications but that all sounded very different under battle conditions. But let's start with what the paper says. As with most capacitor microphones, the Magneto covers a wide frequency range with a response extending from 20Hz to 20kHz (±2dB). The measurement curves SE sent me show a modest presence lift at around 8kHz. The mic's sensitivity is -34dB, broadly similar to other mics of its type, while the equivalent input noise figure is a very respectable 16dB. The lack of a pad switch doesn't seem to worry it much either, as it can handle up to 140dB SPL before the distortion reaches 0.5 percent. While the design is new, the bodywork remains similar in styling to other SE models, with a matte-black finish on both the body and the grille. The latter is a multi-layer design, the inner layer of filtering material being quite fine and thus making it difficult to see the capsule, which seems to be around 23mm in diameter. Removing the two cross-head screws securing the bottom of the mic body reveals that the main casework is made from cast alloy rather than the machined brass employed for many of the more up-market SE microphones — a cost-saving approach that should have no detrimentaleffect on the mic's performance. All the transformerless circuitry fits onto a single circuit board that is populated mainly by surface-mount components and fixed directly to the rear of the XLR connector, rather than, as is more common, being bolted between two support rails. Spring clips on the board edges maintain a ground contact with the inside of the body casing, which is left unpainted. A pair of thin, insulated wires connect to the capsule, which is supported by a moulded plastic base that includes a degree of vibration isolation. Where the optional Isolation Pack shockmount is used, the screw collet at the base of the robust plastic mount locks around the XLR extension of the microphone and holds it quite securely. This feels like an improvement on the usual wire-frame type, as the lack of metal parts means there's less chance of damaging the mic's finish. Starting with my usual speech test, this time side-by-side with the similarly priced Audio-Technica AT2020 for reference, the Magneto came over as having a little more weight at the low end but was fairly similar in the mids and perhaps a hint more airy in the highs, delivering a solid and detailed sound but without any obvious edginess. Despite its more pronounced lows, the Magneto's more dense basket screen also made it a little less susceptible to popping. Regardless of the mic, I invariably record close vocals with a pop shield, though I have to agree with those who have commented that the fabric type can have a noticeable effect on tonality, so I either use a metal mesh screen or, better still, one of the more modern reticulated foam types, as their acoustic transparency is about as good as it gets. With SE's metal screen in place neither mic was unduly prone to popping and I couldn't detect any change in timbre from using the screen. As vocals are usually recorded fairly close to the mic, where the proximity effect lifts the lows in relation to the mids and highs, the Magneto may require a low-cut filter somewhere in the chain, so in this application its added low-end weight may not convey any direct advantages. On acoustic guitar the Magneto performed rather better than I expected for a mic in its price range, with a nice blend of warm but focused lows, balanced mids and a gratifying sense of HF detail with just the right amount of 'zing'. With some mics, a guitar's high end can tend to get a bit 'icy' sounding but the impression here was more of a glittery airiness that stopped short of being overstated. In fact, I used the mic on a serious session with Gordon Giltrap to record some Nashville strung acoustic guitar overdubs for a forthcoming single and it did a great job. Recording my electric guitar combo from around 300mm was also something of a revelation, as clean picking came over smoothly with a punchy snap, once again exhibiting adequate detail without leaning towards sounding brittle. Pile on a bit of drive and the mic didn't flinch — no rasp, no fizz, just a confident, full-bodied sound with just the right amount of bite that was a fairly accurate representation of how the amp sounded in the room. Even taking price out of the equation, I was rather impressed by the Magneto and I plan to use it on a few more serious sessions to see how it stands up against the big boys in other applications. I think SE have really hit the mark with this mic, which seems to be gently flattering almost regardless of what you point it at. This is the first back-electret mic that SE have produced and I know they worked on the voicing for a long time before releasing it, and that time appears to have been well spent. As ever, though, the caveat is that if the mic is for use with a specific vocalist, then try as many mics as you can because what you're looking for is a happy pairing of voice and mic characteristics — and that's something the spec sheets can't tell you. 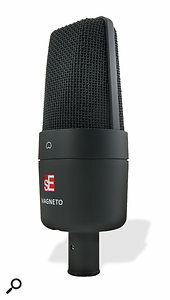 That said, if you need a capable but affordable first mic that can handle most sound sources, then the Magneto deserves to be on your 'must try' list. Equally, you may still find it useful even if you already have a decent mic collection, as its performance doesn't hint at the fact that it is a budget microphone. There are numerous low-cost capacitor mics (including back-electret and conventionally polarised models) available, including the AKG Perception, Audio-Technica's AT2020 and Rode's new NT1. Each has its own character, so try them alongside the Magneto, especially if it's for vocals. Gently flattering sound on voice, acoustic guitar and even electric guitar. Comes in a cardboard box with no plastic storage pouch. The Magneto may be basic in having a fixed cardioid pattern, no pad or filter switches and simple packaging, but it delivers a well-polished performance on a variety of sources and sounds way more expensive than it actually is. It would make a great first mic but could also find a place in an existing mic collection.